A legal bid by the public prosecution service (PPS) and PSNI to gain access to interviews recorded by a former IRA member as part of the Boston College project is to be challenged by the American university. Anthony McIntyre was one of the main researchers in the project. A subpoena was served on the college at the weekend demanding access to interviews about his IRA activities. The college says it will file a motion to quash the subpoena. McIntyre's legal team in Belfast also plan to lodge papers in the High Court challenging the legality of a decision by the PPS to use an international treaty to seek assistance from the US authorities. The subpoena was served on the college by a lawyer acting on behalf of the British government. It compels a representative of the college to appear in court in Massachussets next Friday to provide the material requested. Anthony McIntyre's lawyers team say that request was unlawful. What are the 'Boston tapes'? Dozens of former paramilitaries were interviewed in Belfast and other cities and towns from 2001-2006 as part of an oral history project known as the Belfast Project. Details about internal politics and activities of the IRA were revealed on tape, including accounts of a hunger strike in prison in the 1980s. Overall, the project cost about $200,000 (£118,520), mostly provided by an Irish-American businessman. Each interview was transcribed, sent by encrypted email to New York and then the material was sent to Boston College, where it was placed under lock and key at Burns Library. Following a lengthy legal battle with the college, the Police Service of Northern Ireland gained access to a small number of the interviews in 2013. 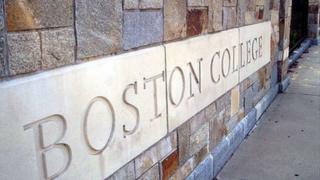 A legal firm acting for Boston College, Locke Lord, has confirmed in a letter that it will also oppose the subpoena. "I can confirm that Boston College will file a motion to quash the subpoena that seeks Anthony McIntyre's Belfast Project interview recordings, transcripts, and related materials," the letter states. "No such materials will be produced pending a ruling on that motion." Anthony McIntyre recorded a number of interviews detailing his own activities during the Troubles, as well as interviewing others. He served 18 years in prison for IRA offences, and insists the police have already questioned him about all of the issues listed in a subpoena served on Boston College.